Theatre series based on the novel by Tom McCarthy. German premiere. 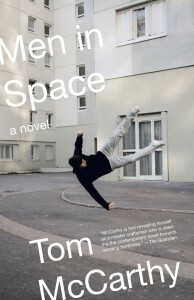 The Uniater ensemble is producing a three part theatre series based on Tom McCarthy’s novel “Men in Space”. The book episodically tells the story of the Bulgarian mafia, which in 1992, shortly after the Velvet Revolution in Prague, wants to sell a stolen icon to the USA. Watched by Interpol, the group’s head comes up with the idea of playing a counterfeit into the police’s hands as a distraction while they get the original out of the coutry. A painter who can make an authentic copy of the icon is sought and found in the Prague art scene. But the artist Ivan creates not just one, but two copies. The events are observed by an anonymous agent who follows every step of the deal with outdated surveillance technology, but becomes more and more entangled in his own fantasies.